On November 8th, National Council For Adoption was proud to honor the achievements of four individuals who have made significant contributions to the adoption community: celebrated radio host Delilah, Washington, DC's Mayor Muriel Bowser, attorney Gregory A. Castanias, and finance expert Stan Collender. Below you'll learn more about this year's group of honorees, with photos by Tom Williams. A special thank you to Kathryn Jean Lopez, who wrote a touching piece on Delilah's adoption story here and recapped the event here. Thank you to our Chairman of the Board of Directors Wayne W. Sharp, Ph.D., who presented the welcoming remarks and to presenters Jane Castanias, Nathan Gwilliam (Adoption.com), and Joseph Firschein for introducing our honorees. Sponsors and supporters of the Adoption Hall of Fame include: Akin Gump Strauss Hauer & Feld LLP, America’s Christian Credit Union, Gladney Center for Adoption, Haefele-Flanagan, The Meltzer Group/NFP, The Russell Group, and United Bank. The Adoption Hall of Fame Award is given annually in recognition of outstanding commitment, service, and sacrifice for the cause of adoption by an individual or organization who has positively impacted the practice of adoption. The Friend of Adoption Award is given annually in recognition of significant contributions made to the field of adoption by an individual or organization. 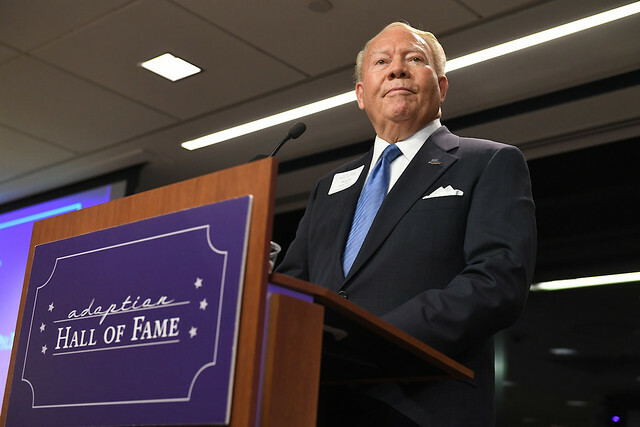 Since NCFA's founding in 1982, the Adoption Hall of Fame and Friend of Adoption Awards have been extended to Members of Congress, sports icons, entertainers, and trailblazers who made history in the field of adoption. Take a look at our distinguished list of past honorees here. Use left and right arrows to scroll through photos. Click a photo to view details. National Council For Adoption’s 2018 Adoption Hall of Fame inductee is nationally syndicated radio personality Delilah Rene (known professionally simply as “Delilah”). As an adoptive mother and advocate, she has demonstrated a decades-long commitment to children in need of a family and has used her radio platform to celebrate adoption, advocate for children in need of a safe, nurturing family, and raise awareness of children waiting to be adopted from the U.S. foster care system. Delilah, the most-listened-to-woman on radio in North America, fell in love with radio as a fifth-grader in her hometown of Reedsport, Oregon. Today, her soothing voice, open heart and love of music has expanded her audience from the folks in Reedsport to more than eight million people on over 200 radio stations in the U.S. and Canada. Delilah is the mother of 13 children, two of whom now reside in Heaven. Also the step-mother to five wonderful young adults and married to Paul, her life is full beyond measure. Ten of her children are adopted; four of them were from the foster care system in Washington State, two of them were orphans from Ghana, West Africa (Sammy, her son who passed away from Sickle Cell Anemia complications was one of these children) and three of them were Liberian refugees also living in Ghana. She advocates for reform in the foster care system and lives the belief of finding forever families for as many children as there are available to adopt. Delilah founded Point Hope, a non-profit organization, in 2005. Point Hope's mission is to raise awareness and champion the cause for forgotten children. The organization serves children in Ghana and in U.S. foster care, providing hope and care in the form of programs, individual attention, and the creation of self-sustainable programs that benefit families and persons domestically and worldwide. Delilah was inducted into the Adoption Hall of Fame by NCFA Board member Nathan Gwilliam, who has known Delilah since 1999. Thanks to Nathan for sharing this video with us! Muriel Bowser is a proud fifth generation Washingtonian and has served as Washington, DC’s Mayor since 2015. As Mayor, she is focused on building pathways to the middle class, making the city’s prosperity more inclusive, and fostering a culture of inclusion, transparency, and action. Previously, Mayor Bowser served as the Ward 4 councilmember on the Council of the District of Columbia—first elected in a special election in 2007, and re-elected in 2008 and 2012. National Council For Adoption is proud to extend the Friend of Adoption Award to Mayor Bowser in recognition of her openness to share her personal adoption story with Washington, DC and the entire nation. Saying that she was “thrilled, nervous, and looking forward to each and every stage,” Mayor Bowser’s joy in adopting baby Miranda is something that many families can relate to. Her experience has not only increased awareness of adoption, but has also fostered good will across a broad spectrum of political views—showing once again that adoption brings people together. Celebrated attorney and father through adoption Greg Castanias will receive the Friend of Adoption Award on November 8th. Greg and his wife Jane (who received the Friend of Adoption Award in 2016) have been strong advocates for adoption in their personal and professional lives, devoting their time and resources to advance the cause of adoption, and particularly resources for those pursuing adoption after an infertility diagnosis. Greg is a board member of The Gladney Center for Adoption and, in his capacity as a partner of Jones Day Law Firm, has been a regular pro-bono legal adviser to National Council For Adoption for many years. Most recently, he filed an amicus curiae brief on behalf of NCFA, helping educate the court on relevant adoption information. National Council For Adoption is proud to present Stan Collender with the Friend of Adoption Award for lending his expertise on important adoption-related federal budget issues. He assisted the Adoption Tax Credit Working Group (of which NCFA is a member) in 2017 as we advocated to preserve the adoption tax credit in the comprehensive tax reform legislation. As an expert on the federal budget, federal spending and revenues, and the congressional budget process, Stan helped craft op-eds and Q&A factsheets to educate the public on the impact the adoption tax credit has on American families and how preserving it makes a measurable impact on the future of adoptions by U.S. parents. Throughout 2018, Stan has provided pro bono communications consulting to NCFA that has resulted in helping us more effectively and responsibly communicate our message, including helping us publish our op-ed in USA Today regarding intercountry adoption, which received significant attention and helped ignite a national conversation about intercountry adoption.